Hollywood doesn’t limit opportunities for actors of color, Morgan Freeman said Tuesday at a Screen Actors Guild Foundation event at Britain’s Oxford University. Freeman said he admired actors like Sidney Poitier, but didn’t see himself as an African-American performer. “I don’t want to be called African-American. Why not? Because I’m not African,” he said, according to a release. Freeman also dismissed the criticism that the entertainment industry was sexist. “Streep, Blanchett, Roberts, Thurman, Kidman—no I don’t think there’s an unfair portrayal of women in Hollywood,” he said. The Oscar winner appeared at Oxford as part of a conversation series featuring “legendary” actors. 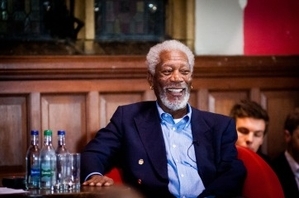 The inaugural event, titled “Conversations with Morgan Freeman,” was held in the historic university’s debate chambers. Oxford recorded the career retrospective with Freeman and provided the video to the SAG Foundation Actors Archive and its online video gallery. The SAG Foundation said Morgan’s address was just the beginning.